Anyone remember the scene in 50 First Dates when Lucy hangs out at the Hukilau Cafe building cabins out of waffles? That was the first thing that came to mind the very first time I walked through the yellow screen door of Rutt’s Hawaiian Cafe. We frequently stop by on lazy Sunday afternoons for one thing — the royales. 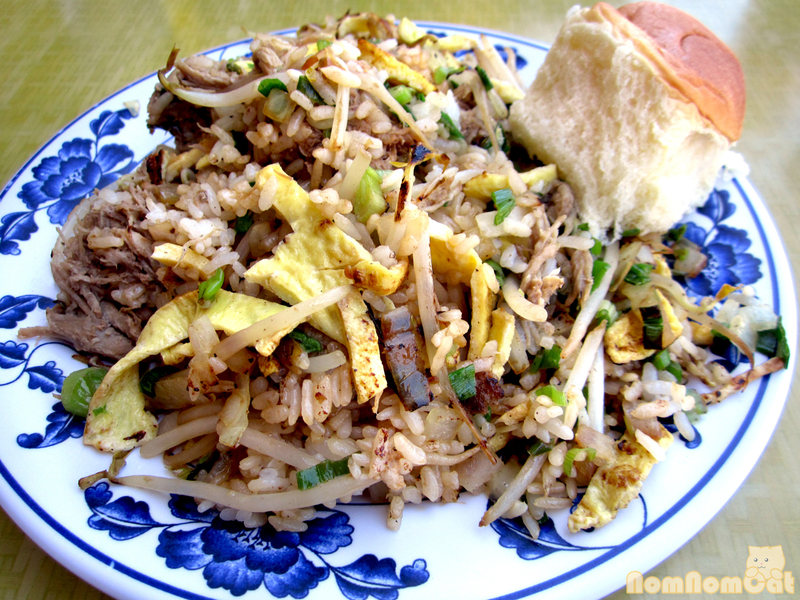 Royales are basically a Hawaiian style mixed rice — generous mountains of rice mixed with bean sprouts, strips of egg omelet, green onions, and your choice of meat ranging from kalua pork to Portuguese sausage to the Hawaiian staple SPAM. Even better – you can order them fried! They come in three sizes: the junior (one scoop of rice & two eggs), the regular (two scoops of rice & three eggs), and the king (three scoops of rice & four eggs). Don’t be fooled – each “scoop” is giant. The one pictured above is only a junior! If I am ordering takeout or otherwise intending to have leftovers for the next day’s lunch, I would order a regular sized royale. Otherwise, the junior is more than enough especially when paired with the (free – just ask!) Hawaiian sweet roll that comes with it. 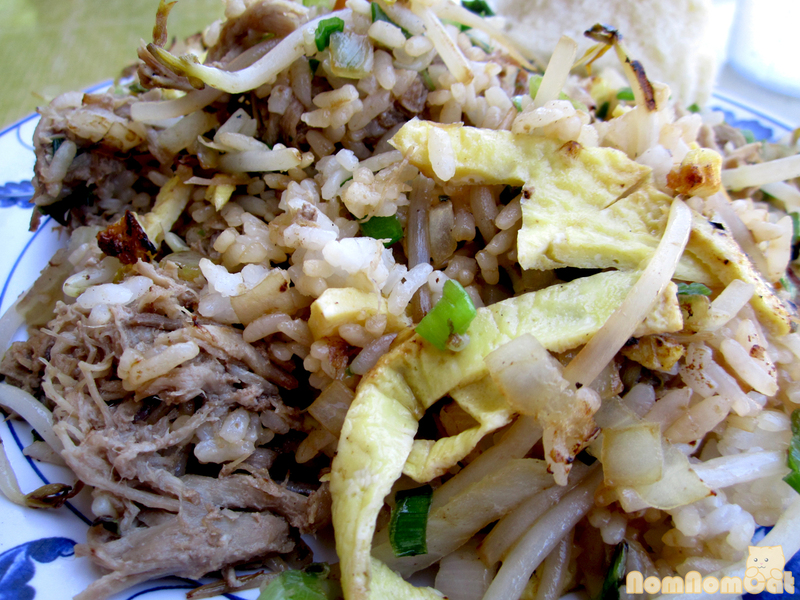 The kalua pork is my favorite as it is always juicy, flavorful, and reminiscent of luaus (no matter how touristy). An artistic drizzle of sriracha and I’m set! Occasionally I’ll stray from the Royales section and try something different. The plate specials are good (especially the mixed plate special that features a combination of kalbi, kalua pork, and teriyaki chicken for only $8!) 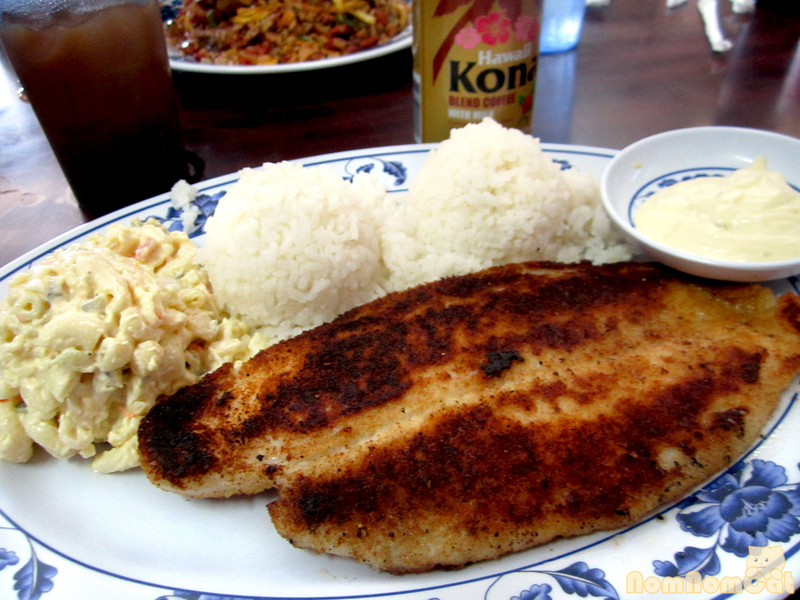 but my latest discovery was the filet of sole. A football sized, 1/2-inch thick filet of white fish breaded in panko (?) and grilled to perfection. The fish was flaky and moist, barely opaque. It comes with two scoops of rice and (of course) macaroni salad. To round out my island adventure, I sometimes splurge on either a can of ice cold UCC Kona Coffee or, if I spot it on the specials menu, a manapua (BBQ pork bun or cha siu bao). On my first visit, I also ordered the haupia for dessert, but I don’t think I have seen it recently. A traditional Hawaiian dessert, haupia is essentially a coconut pudding, and the one at Rutt’s was topped with extra toasted coconut shavings. Yummy coconutty goodness. Have you heard of the book Death By Gumbo by Phil Edwards? It’s not a long book and it’s purely a fiction crime/food novel but one of the characters is a Hawaiian chef. 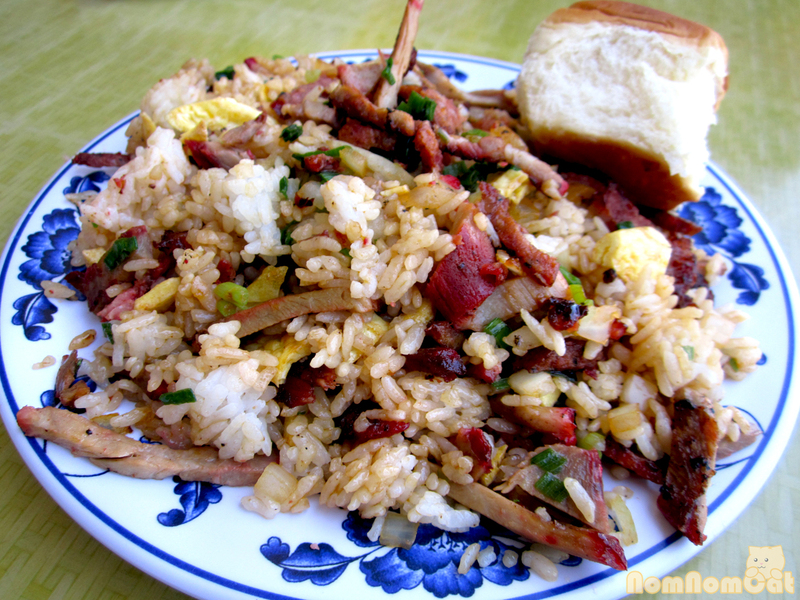 It really made me crave Hawaiian food! Oops, I meant the book “Lobster Karma” by Karen Gallas. I was reading those two book at the same time and confused the titles! I haven’t read either book, but I’ll have to check them out! They’ll be on my reading list after Bourdain’s Kitchen Confidential.